YA'AN, CHINA - After a powerful earthquake on Saturday, China is continuing a massive rescue operation in the Sichuan province. The earthquake left at least 189 dead and more than 11,500 injured, reports BBC News. Thousands of survivors have been forced to seek refuge in cars, tents, and makeshift shelters. China mobilized more than 18,000 soldiers and police for rescue efforts, as well as deployed 23 helicopters from the armed forces, says state news agency Xinhua on Sunday. The Sichuan Red Cross estimates that within three days, the water in Ya’an will run out despite their efforts to deliver supplies to the quake-hit areas, reports CNN. In more remote areas, people anxiously wait for evacuation along the shifting earth muddied river waters. Due to the landslides that were triggered as a result of the earthquake, roads were cut off, and power and phone connections were disrupted. The landslides blocked access to aid trucks and prevented some of the casualties from being brought out. Though emergency teams were quick to carry away bodies and search for survivors, CBS reports that they have done little so far to distribute aid. Even in the more accessible areas of Lushan, BBC correspondents respond that aid has been hampered by road congestion. The survivors of the earthquake additionally face massive displacement. Despite best efforts, thousands of survivors are now homeless and are forced to seek shelter wherever possible. The collapse of several buildings, including schools and nurseries, lead to widespread criticism of local government’s planning policies, report BBC. 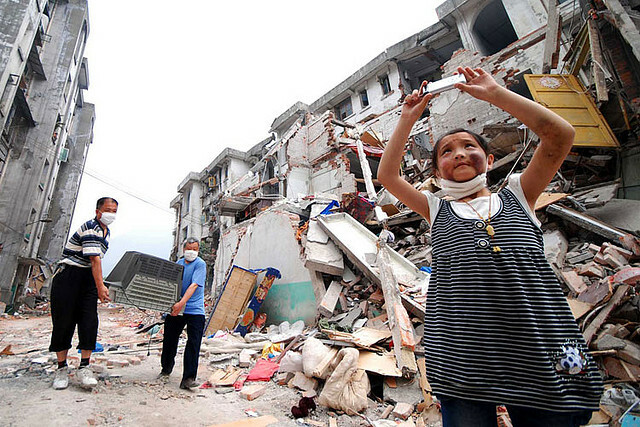 In Longmen village, Chinese authorities said nearly all of the buildings had been destroyed. Some of the hardest hit areas were the villages further up the valleys in Lushan, where farmers grow rice, vegetables, and corn. It is the poor who feel the brunt of this disaster, with the biggest killer not the earthquake itself but poorly constructed houses, BBC reports.